I didn't land any punches but was on the fringe of such a diplomatic encounter, at San Francisco International. One POS let fly on people just ahead of me (all of us carrying seabags). The guy ahead and closest to him decked him with one punch and never let go of his bag. We never broke stride, just kept on going. HUP, troop, TRAY, four! Show of hands. How many military men - especially Vietnam Vets - would have allowed some smelly hippy to spit on them? Maybe from behind. Maybe if he took off running. Other than that, we would have been knuckle drilling right their in the airport. My dad lost a leg in the Wagon Wheel in the Mekong Delta. When he got off the plane in San Francisco a hippie tried to spit on him. The result was the hippie lost several teeth and a bunch of skin from a one legged man in an a$$ kicking contest. It has become a common refrain of many that the left, or the peace movement, or the socialists, or whomever handicapped the Military or prevented the military from winning the Vietnam war. The reality is the Vietnam was was unwinnable. The article posted above by the fierce Vietnamese casualties in the Tet offensive is both absolutely true and absolutely irrelevant. By 1969 our combat effectiveness per capita was dropping in the field, drug use was rampant and crippling, 'fraggings' and suicides were at an all-time high in the field, voluntary re-enlistments were way down, and we were unable to achieve any strategic objectives. But though the war fatigue was seriously hampering our fighting power, even that is secondary to the simple reality: South Vietnam had passed through five ineffectual leaders during our time there, they were loathed by the people who were coming to support the North more and more, while the effectiveness of the ARVN dropped to nearly zero. The North was winning the hearts and minds, and more and more of the South rural areas were controlled by VC/NVA. In 1969 alone we suffered 11,000 dead and almost 40,000 wounded, and we were spending about 15 billion (1972 dollars) per year just on the war. Ther was no military way to win that war by 1969, none at all: short of turning South-east Asia into a parking lot. This is no disrespect to the men who fought and served in that war, and please do not take it that way. I have to say this. There is no way the hippies won any war. We won every battle in Viet Nam Nobody beat us. We just QUIT. Any time you have politician running the war, it is always suicide for our men and woman. complex question for a free nation. Although Truman and Eisenhower both supervised actions to undermine the communists in North Viet Nam, the "broad commitment" made by Kennedy and escalated by Johnson causes this to be a Democrats war. The Republicans came in on the promise to end it. How then, was it possible for the Democrats to capture the majority, those opposed, after the war was ended? Was it McGovern? It does not make sense. I can't speak for the Marine Corps, but I can relate from personal experience and observation that during my tour, I can say I only ran into two "hippie hating hotheads," or, should say, two who were willing to somewhat publicize that opinion. Among America's military, the prevailing attitude is decidedly open to the "differences" recruits bring to the table along with their enlistment. I think the US Army is even more so, respectful of differences -- cultural, physical, religious, and all of that. People who go around labeling and playing the blame game are not made leaders. There are convincing arguments that the war was a mistake, and that in ending it, officials were looking around for someone to blame. There is also a strong position that holds the spitting incidents are in the category of the urban legend. I could tell you a good one on that. On my tour, I ran into two open Jane Fonda haters, although I have no doubt the numbers of discrete opinions far exceeded that; I mean, the closely held opinions. One was a Master Sergeant everyone respected very much. He was a solid Marine. The other was a fat Irish Top, who another Top said was just being a "good party member." Remember, General Chapman pulled the Marines out of Viet Nam. These anecdotes amount to a hill of beans, really. Anyone can comment on my thoughts here. Feel free. But the lingering question, which I would be happy to hear a good answer to, is how is it that the left seems to consistently outmaneuver the conservatives in registering the majorities after eras like Viet Nam? When I see thread titles like this one, "How The Hippies Won The Vietnam War" I cringe. That's because I see us playing right into the same old hand. For the war in Viet Nam? Vote GOP. Against it? Vote Dem. It reminds me of an Alabama Governor's race after WWII when one candidate told the other, "You can have the officers' votes, I'll take the enlisted vote." We should know that the people who suffer most are the ordinary working people -- their kids are the ones in the line of fire. whole thing around, by electing and getting behind the President we see now. Instead of recognizing George W. Bush as the hero he is, the public looks at Barack as the role model. Anyone have a positive resolution to all of this? Hah! That's what I'm talking about. If voluntary enlistments were down, how was the US able to end the draft and move to a voluntary army. And many of those fraggings had to do with the way the military used a checkoff system to supply and promote its officers. Every officer would have to have some combat experience, some staff experience, etc. etc. ; and would never stay in any position long enough to become competent at his job. Troops didn't appreciate having some new clown come in and practice on them. So they found a way to "move" the incompetents along. By 1969, the Democrats had proved conclusively that they had micromanaged and second-guessed that war until Nixon's administration could only withdraw, rather than fight to win what Dems had irretrievably ruined. The way the post is titled does not leave much room for debate. It does open the door for opinions to be aired again and for facts to be laid on the table by a generation that is now starting to exit. plan? And, what was the story on the emergence of college groups, many of them openly communist. How were they able to become so influential? 2) Was the Pentagon, itself, fooled or duped, and by whom? Some analysts claim the Vatican was the true force behind the events in Viet Nam, and that it was the Vatican that was behind the effort to bring that part of the world into line with the West. If that could be proved, then the reason behind the war was achieved. 3) If we tall about the Vatican, we are naturally led into a discussion of the White House, which was occupied at the time by America's first Catholic President, who also happened to be probably the most activist ever, meaning active to achieve his own goals, not waiting around to talk about things. Those are three questions that keep coming up in the fringe research, not to be confused by lunatic fringe research. Two fairly obvious events set the stage for the explosion in troop deployment. First, the Gulf of Tonkin incident in August 1964 led to Congress passing the Southeast Asia Resolution (often called the Gulf of Tonkin Resolution) on August 10. This act gave one man -- LBJ -- virtually unlimited authorization to wage war in Vietnam with conventional weapons, without further need to seek permission from Congress. (For the next four years, the war in Vietnam would be essentially Johnson's personal plaything.) Second, LBJ was elected in November 1964 for a full term as POTUS in a lopsided defeat over Barry Goldwater, thereby placing Johnson firmly in his inherited position for the next four years. 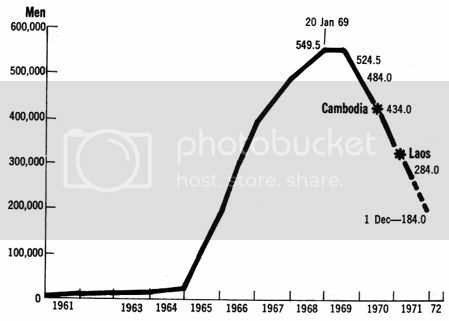 Troop deployment in Vietnam still hovered around a paltry 20,000 at the end of 1964, more than a year after our "first Catholic president" -- the presumed channel for Vatican influence -- was laid to rest. Four years later, when LBJ left office, there were 550,000 American troops in Vietnam -- an increase of 2,650%. The Johnson administration botched it! Pure and simple. His guns and butter philosophy cost our country over 55,000 live of American citizens. The way the war was fought was criminal. Goldwater had the right idea of flattening the damn place, the left convinced the citizens he was a nut. Pitiful. I lost two fraternity brothers and one friend who were helicopter pilots and I am sure many of us suffered the same losses. They withdrew because the North Vietnamese had been beaten into submission and signed the PARIS PEACE ACCORDS of 1973, which all the leftards "never" seem to remember. Having gotten a peace treaty, the US troops went home, after promising to support the South Vietnamese. Of course during Watergate the Democraps took the opportunity to screw over the South Vietnamese, for the crime of being American allies, and not wanting to be ruled by their Socialist "brothers". By the time LBJ came around, the reason war had been established as the stopping the spread of Communism in South East Asia. Yes, it is commonly believed that the Vatican has not had a hand in world affairs since the 17th century. Others see things quite differently. not allowed to leave, by the Viet Minh, we can see the exit of the French resulted in a mass realignment and the emergence of a powerful communist state in the North, allied with Red China. We notice the aims to the communists were to kill the Catholics. Here are a few of those "lunatics" on the subject of the religious element of the conflicts in Viet Nam. It is important to pay close attention to some of the events near the end of French colonial rule. In particular, the establishment of a Communist government in North Viet Nam, linked to Red China. Background to 1949. The affairs of the French colonial empire. The place of religion in the Wars in Viet Nam. human rights violations as cover to reduce involvement. August 31, 1963. Three months later, the President was killed.